Ever dreamed of visiting the shining tip of the Empire State Building but never been, then come and enjoy the next best thing in our Warhol inspired Empire room at Arthouse Hotel. 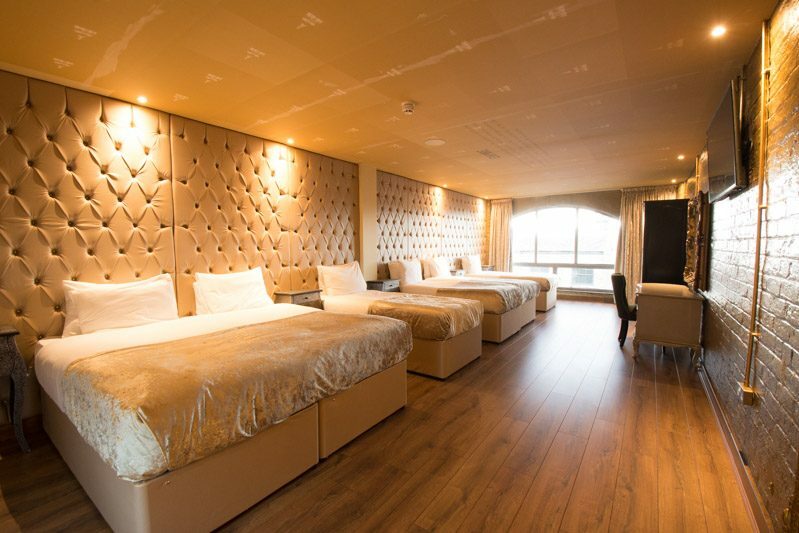 This glistening city centre group accommodation can sleep up to six people in luxury style and comfort. 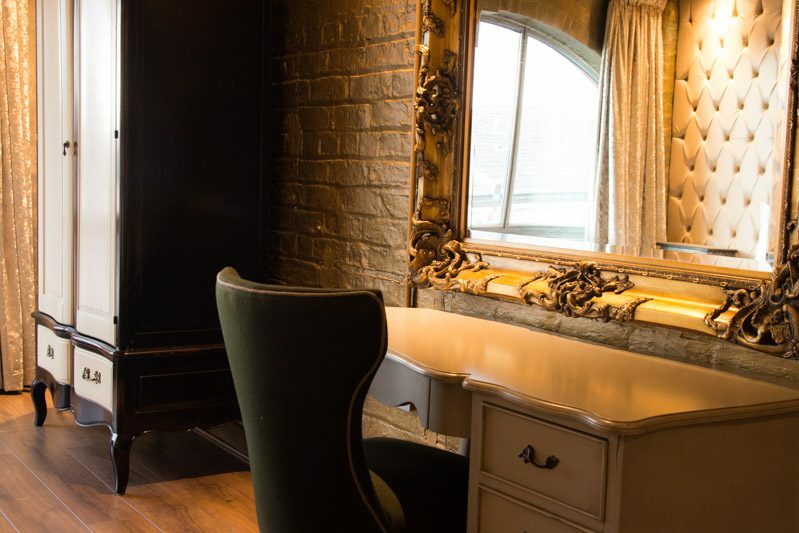 Enjoy the glamour of the gilded brickwork walls and the indulgently designed spacious bathroom complete with double whirlpool bath. Empire comes complete with a fully functioning kitchenette perfect for storing and preparing drinks and food during your stay. For your entertainment, you have your very own huge flat screen TV and can play music from your media device on Bluetooth music systems located within your room. 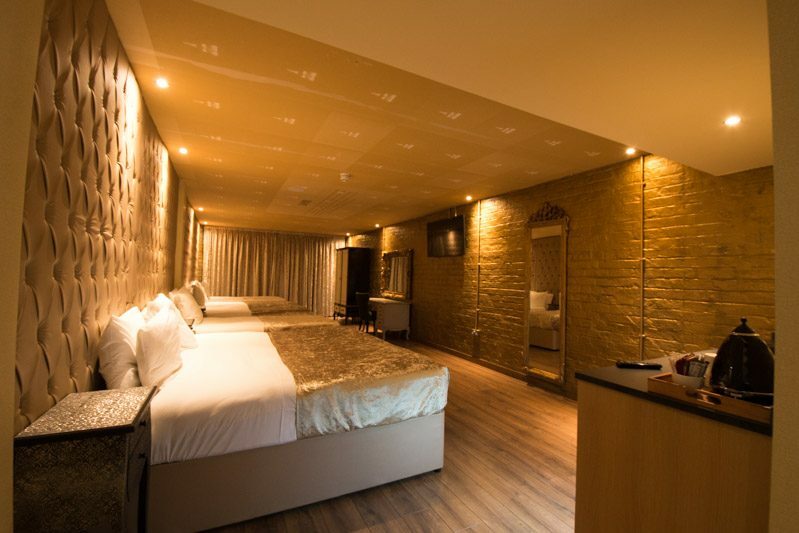 Arthouse Hotel is at the centre of Liverpool’s thriving nightlife and social scene, with easy access to the best bars, hottest restaurants and all your favourite high street shops. 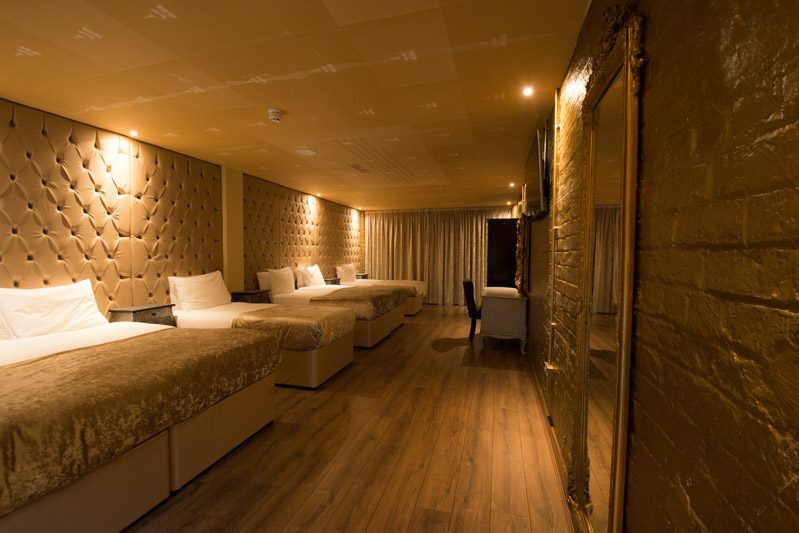 For a memorable night in Liverpool chose to stay in Empire at Arthouse Hotel. Andy Warhol’s eight-hour long black and white silent movie Empire captures a fixed view of the iconic New York structure the Empire State Building. The movie was shot from the 41st floor of the Time-Life building from the offices of the Rockefeller Foundation. Filming commences just before sunset at 20:10 pm when the audience are presented with a bright white screen. The Empire State Building begins slowly emerges into focus as the sun dips behind the horizon and stays there until 02:30 am when the floodlights of the building turn off and the last few frames of the movie are in complete darkness. The movie premiered March 6, 1965. Shortened versions of Empire were not allowed to be screened as Warhol intended the unwatchability of the movie to portray an important message. The length of the full screening of Empire was supposed to depict the passing of time. Encouraging his audience to slow down and appreciate the finer things in life. Warhol’s Empire runs for, what is considered by most to be a full working day, which is said to reflect Warhol’s working class background. Throughout Empire, each passing hour is marked by a flash from a beacon on top of the Met Life Tower. Some say this is the perfect symbol of passing time to match the message intended in Warhol’s Empire. In between some of the reel changes the audience can see Warhol, filmmaker Jonas Mekas and John Palmer’s reflections in the office window. This occurred when the lights had not been switched off before filming recommenced. These glimpses gave the audience an understanding of the time and effort made to produce the movie and were also another way for Warhol’s artwork to portray a slowed down reality. The original footage lasted just over 6 hours but Warhol insisted that it was screened in slow motion to remove the film from reality and transform it into an art installation. In the list of longest experimental films of all time Empire only reaches number 19. The longest movie at the very top of this list, Logistics, screens for 35 days and 17 hours and was released in 2012. The original idea for Empire came from a casual conversation between Jonas Mekas, filmmaker, and John Palmer, underground film scene wunderkind. The pair were passing by the Empire State Building one afternoon and thought Warhol might appreciate the challenge to shoot it. Warhol took on the task and, as with his artwork, created a movie that challenged the preconceptions associated with filmmaking. This time he wanted to confront the existing notions about the art of making movies by turning a very physical thing into something psychologically challenging. Empire was sent into the film world as an alternative way of approaching the artistry of filmmaking and in appreciation of one of the world’s greatest pieces of architecture. Warhol captures a new modern message in his film Empire, that is projected by the building today. Where once the Empire State Building was lit to honour its presence as a significant piece of architecture, today it is an advertisement of itself and New York city. The Empire State Building was, therefore, the perfect subject for Warhol, who’s work sets out to make his audience care more about the little things in life. Just like his paintings of everyday objects such as Campbell’s Soup cans and sculptures of Brillo boxes , The Empire State Building is just another piece of advertising that Warhol transformed into art.